In June 2007 the station was awarded a further ten year licence for the period 2007 to 2017 on the basis of the business plan submitted to the Broadcasting Commission of Ireland. A further licence for the period 2017-2027 was awarded to CRCfm in Februry 2017. 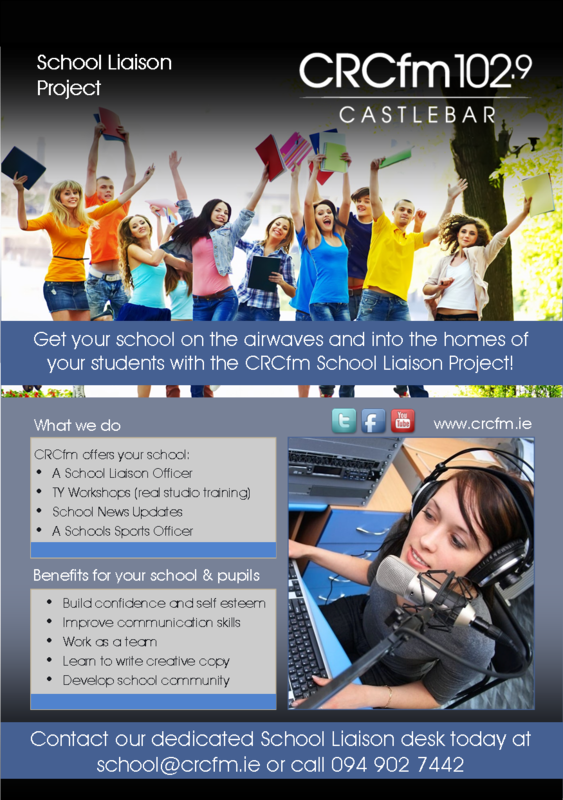 "The service should reflect the needs in the local community as well as educate, entertain and inform its listeners"
CRC moved to new premises on Lower Thomas Street in the centre of Castlebar on 29th December 2016 and is completing a purpose built facility with three studios - any of which can be used as a live studio. Programming is very much community based, mixed in with other topics of general interest to the listeners and this is broken down into fifty five percent music, with a broad range including pop,country classical,middle of the road traditional and a range of specialist music such as jazz and other genres. The remaining forty five percent of programming is devoted to community issues, current affairs, magazine and specialist programmes in education, health, environment sport and the Irish Language. The station has received national recognition for its work in the area of educational broadcasting, having developed programming for people with literacy difficulties and through its distance education project Survival English for non Irish nationals. In addition, there has been a particular focus on specific target groups such as active retirement groups, women’s groups and young people. The station was also involved in the past with the European Project NOW - New Opportunities for Women, during which fifteen women completed a radio broadcasting course. The station regularly engages in outside broadcasts from within the community and focuses on special community events. Each year the station organises training for volunteers in co-operation with Mayo Vocational Education Committee, Further Education Services and many of the stations volunteers have joined CRCfm as result of these training courses. New volunteers are given induction training in the station before going on air. The station raises its income mainly from donations from local bodies, grant aid from funding bodies and limited advertising and sponsorship (limited by BAI). A number of fund raising activities are organised annually as well. A membership scheme also is also in place. Staffing in the station is supported by grant aid from POBAL through a Community Services Scheme and by the participation of over fifty volunteers. The management structure is designed to facilitate feedback from, and interact with the community. The structure involves a number of sub committees appointed by the board to contribute to the operation of the service. A Grievance committee is activated when necessary, comprising two company directors, one staff member and two independent members. CRCfm broadcasts 24 hours per day to an area in and around Castlebar, populated by more than 30,000 people from various backgrounds. CRCfm maintains the key aspects of access, participation and volunteerism to the forefront in the day to day operation of the station, including programmimg. Sometimes it's hard to catch the live broadcast of your favourite programme - or you just might like to hear it again. So here's your chance to catch up. CRCfm offers you the opportunity to showcase your business to a local audience of 30,000 people who live within our franchaise area in and around Castlebar, Mayo and to a world wide audience online. We can help script your idea into a 15 or 30 second ad which can be produced in-house at our modern production studio or outsourced to one of our affiliate production companies. Our Sales team will be happy to discuss your requirements and the options available to you through spot advertising, sponsorship or outside broadcasts from your business. Our rates are exceptional value for money and we offer you an audience the other stations can't. The following notice outlines our obligations under the EU General Data Protection Regulations (GDPR), The Data Protection Acts 1988 & 2003 ("The Acts") and Statutory Instrument Number 336 of 2011 European Communities (Electronic Communications Networks and Services)(Privacy and Electronic Communications) Regulations 2011 ("SI 336/2011"). • Legitimate interest of CRCfm Clg. CRCfm Clg. will not pass on personal information to a third party without first establishing consent from the data subject. CRCfm Clg. takes its responsibilities in regards to data security seriously. CRCfm Clg. will endeavour to apply measures to comply with the GDPR to the best of our ability. These measures will include technological security, staff training, staff and public awareness and regular reviews. CRCfm Clg. aims to hold only accurate, complete and up to date data. Persons may update their data via email or by contacting the station directly. CRCfm Clg. may also contact individuals/groups directly to update information. CRCfm Clg. will not collect more data than is necessary for the purpose for which the information is collected. Data which is excessive or no longer relevant will be deleted. CRCfm Clg. will retain personal information only for as long as is necessary for the purpose for which it was collected. A request can be made in writing to the station. CRCfm Clg. will respond within 40 calendar days of receipt of the request. This website is provided “as is” without any representations or warranties, express or implied. CRCfm makes no representations or warranties in relation to this website or the information and materials provided on this website. * for any business losses, loss of revenue, income, profits or anticipated savings, loss of contracts or business relationships, loss of reputation or goodwill, or loss or corruption of information or data. These limitations of liability apply even if CRCfm has been expressly advised of the potential loss. * matter which it would be illegal or unlawful for CRCfm to exclude or limit, or to attempt or purport to exclude or limit, its liability. We aim to deliver the best possible service to our listeners. We also aim to ensure that our programming is compliant with the requirements set out in the Broadcasting Act, 2009 and broadcasting codes published by the Broadcasting Authority of Ireland (1) We welcome and will engage with all feedback, both negative and positive, from our listeners concerning any aspect of our service. We are obliged under the Broadcasting Act, 2009 to have in place a Code of Practice for handling complaints from our listeners. This Code of Practice sets out and explains our complaint process for listeners and ensures that we deal with complaints in an effective and efficient manner. It should be noted that the Code of Practice only relates to certain categories of complaints as detailed below. (i) News We will ensure that our news programming is objective and impartial without any expression of our own views. (ii) Current affairs We will ensure that our current affairs programming is: - objective and impartial without any expression of our own views; and - will treat the subject matter and all interests concerned fairly. If we cannot achieve fairness, objectivity and impartiality in one current affairs programme, we will do so in related broadcasts that will be broadcast within a reasonable period of each other. (iv) Commercial Communications All commercial communications broadcast by us will be in compliance with the BAI General Commercial Communications Code and the BAI Childrens Commercial Communications Code If you have a complaint that does not fall under the categories set out in (i) to (iv) above, we would invite you to avail of our feedback/complaints facility at info@crcfrm.ie If your complaint concerns alleged defamation, you should refer to the BAI Right of Reply Scheme The BAI codes can be accessed at www.bai.ie or are available on request from the BAI offices. Community Radio Castlebar is committed to protecting the rights and privacy of individuals in accordance with the Data Protection Acts 1988 - 2003. The Broadcasting Act, 2009 requires you to make your complaint not more than 30 days after the date of broadcast: (a) if your complaint relates to one broadcast, 30 days after the date of that broadcast; (b) if your complaint relates to two or more unrelated broadcasts; 30 days after the date of the earlier or earliest of those broadcasts; (c) if your complaints relates to two or more related broadcasts of which at least two are made on different dates; 30 days after the date of the later or latest of those broadcasts. Complaints submitted outside of these time periods cannot be considered. Once we have accepted your complaint we will work to resolve the issue/s as soon as possible. Your complaint will be carefully considered, investigated if necessary, and responded to in writing by our Station Manager or a senior member of our programming team. ·We will write to you to acknowledge receipt of your complaint within 7 working days. ·We will consider the issues raised in your complaint. ·We will listen to the programme/broadcast item identified in your complaint. ·Where appropriate, we will consult with any party to which your complaint relates, for example, the advertiser, the presenter or programme maker, to give that party an opportunity to provide observations and comments in relation to the issues raised by you. ·We will provide a response to your complaint which will, as far as possible, address all of the issues/concerns you have raised. We will set out the reasons for our decision on your complaint. This response will be sent to you within 21 days from receipt of your complaint. We are required under the Broadcasting Act, 2009 to keep a record of all complaints submitted in accordance with this Code of Practice for twoyears. We are also obliged to provide these records to the Compliance Committee of the BAI if the Committee so directs. Our records will include copies of your complaint, our response/s and the audio copies of the broadcast material. (1) The Broadcasting Authority of Ireland (BAI) was established on October 1st 2009, as an independent regulator for radio and television broadcasters in Ireland. Its functions, roles and responsibilities are set out in the Broadcasting Act, 2009. (2) CRCfm is not obliged to send you a copy of any broadcast. You yourself should have heard/viewed the broadcast in question if making the complaint.